We can avoid identity crises by finding our identity in Christ. How often do we have identity crises? When life changes, as it often does, it may cause us to feel like our identity changes with it. When our job changes, we may go from identifying ourselves as “employed” or a job title such as a “librarian” or “nurse” to “unemployed” or “retired.” No longer does that skill or title define us. When our family changes, we may go from “mom or dad of (insert child’s name)” to “empty-Nester” or “unknown.” Other family changes may be due to a change in marital status or a broken relationship. Our health may change causing us to go from “able” to “dependent.” Life brings so many changes – both natural and those caused by circumstances. Many of these changes can bring feelings of fear and uncertainty. But the Good News is that when we become a believer in Christ, our identity is made certain because God doesn’t change. (Hebrews 13:8) No longer is our identity based on what we do or who we are, but on Whose we are. We are now forgiven, accepted, redeemed, declared righteous, and so much more based on Who Jesus is. Now we find our identity in Christ! We may know this in our heads, but how do we live this new identity out and not revert to our old ways of thinking? God’s Word speaks to this! Living out our new identity in Christ has to take root in our thinking – “our attitude of our minds.” It must be based on Who God is – “His likeness,” not on ourselves. In John 4 Jesus talks to the Samaritan woman at the well and speaks of living water. He is the Living Water…in contrast, I am the one who is thirsty, the recipient of His refreshing. In John 8:12 Jesus calls Himself the Light of the World, and in Matthew 5:14-16 He says we are the light of the world. He is the Light…because of that, I am to be His reflection and shine His light. In 1 John 4 John tells us in verse 8 that “God is love.” Then he continues in verse 18 – “There is no fear in love, but perfect love casts out fear.” He is love – the Fear Conqueror. I am the one who takes refuge in Him. Isaiah used this same identity clarification thinking when he calls God the Potter and we are the clay. One of my favorites is found in Roman 15:13 where Paul refers to the God of hope filling us with joy, peace & hope. He is the Filler…I am the filled. When I focus on Who Christ is, it helps me accurately clarify who I am. His love changes everything…even my identity! 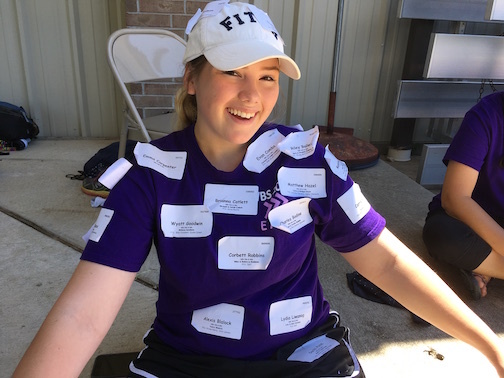 We don’t have to be a “Name Tag Nanny” wearing everyone else’s name tags when we can wear one that says we belong to Jesus! Let's find our identity in Christ. Here are 27 Scriptures that identify who we are in Christ. We are accepted, secure & significant! Let's share this Good News with others today!